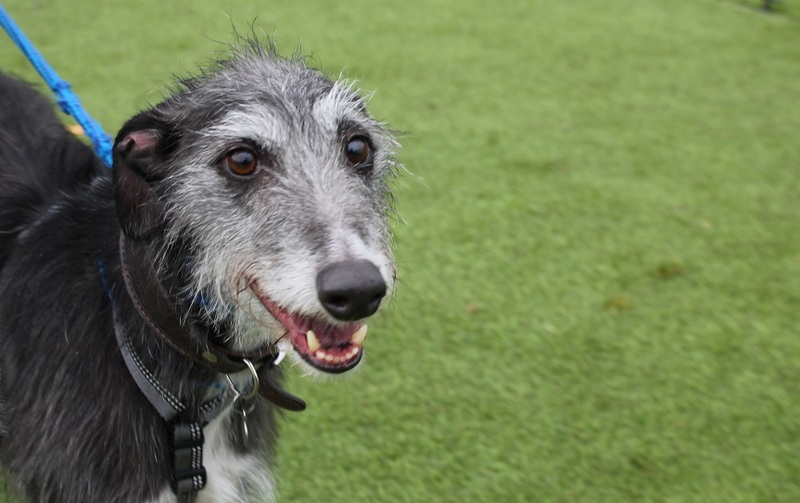 Finn is a 5 year old male Lurcher. Finn is looking for a new home as his owner is struggling to handle him on walks as he can be reactive towards other dogs. He does currently live with another dog who he gets along really well with and he has also socialised with a pack of dogs in the past. When Finn is carefully introduced towards other dogs and recognises them as a friend he is fine, however he becomes anxious when strange dogs approach on walks and can be difficult to control. Finn has been in his current home for just over a year after he was being given away online due to the ill health of his original owner. He was quite underweight and it was likely that he was rarely walked/socialised. He did also live with another dog in this home. 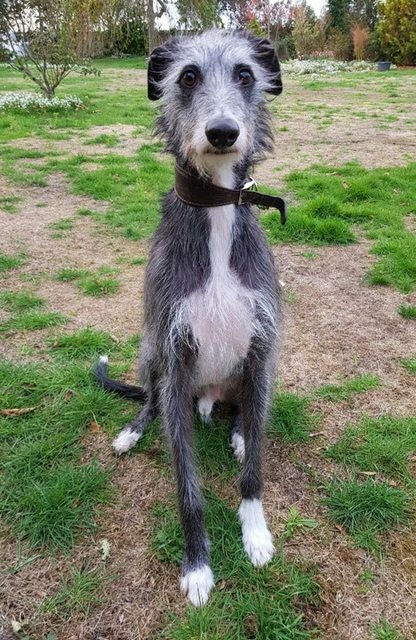 He does not like cats and although he does have a Lurcher chase instinct it is not as intense as most Lurchers and he can be easily distracted but we are looking for a home free from small furries. In the home Finn is very good mannered, calm and clean. He is a clever boy who can open doors! He travels well in the car and is fine with the vet. Finn is an affectionate boy who loves cuddles. He currently lives with two children aged 9 and 12 and could live with children over the age of 8 in his new home. Finn is used to being left alone for around 4 hours a day but may become anxious if he is left any longer than this. Ideally we are looking for an experienced home for Finn with a confident handler who can control him on walks and help him overcome his anxiety around strange dogs. It is important to note that Finn has never attacked another dog and is comfortable wearing a muzzle on walks. He would be best suited to quiet walks at quiet times of the day. We feel that he could live with another dog but this would be dependent upon several introductions here at the rescue so please bare your location in mind should you wish to inquire about him. It should also be expected that the first introduction may not go very well due to Finn’s initial reaction when he first sees a strange dog. Overall Finn is a sweet boy and his family are very sad to have to part with him. He has so much potential and we are desperate to see him happy and settled.